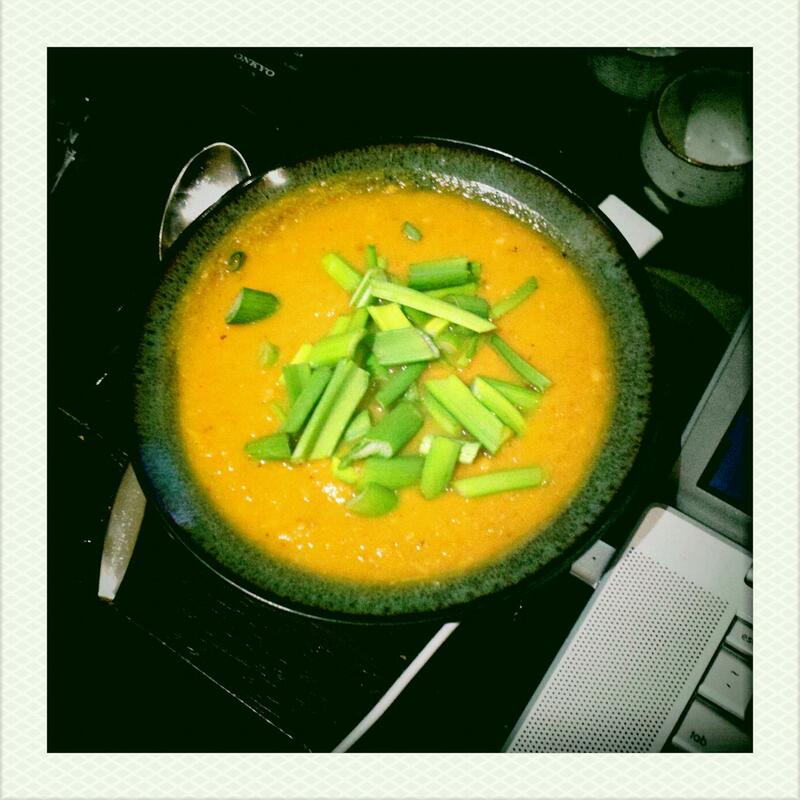 Last night I made a butternut squash soup that was otherworldly. Someone asked me for a recipe, so although I made it up on the fly and I lack photos of the process, I'd love to share it with you. Heat 2T olive oil in a large sauce pot (I find that medium is a good temp, as you don't want to burn the garlic). Mince garlic, and dice onion, leek & jalapeno & sautee with a little salt & pepper until the onions are translucent (about 10 minutes or so). At this point, I add the spices. This has to be to individual taste, and I didn't measure any of these, but here is what I can tell you: I added the most cumin & chili powder, around 2 tablespoons cumin and 1 tablespoon chili powder, though my estimates could be off. I splashed in probably a teaspoon of the dried herbs, and then added literally a pinch of smoked paprika and cardamom each. I put in a dash of red pepper flakes for added heat. Please adjust based on what you like, then stir in the spices. At this point, add the cubed squash, mushrooms & carrots. Add the 4 cups of vegetable broth & stir. Add in salt & pepper (I am generous with both), and bring to a boil. Then, cover & simmer until everything is cooked through (since my squash was raw). This took maybe 30 minutes, but it depends on your stove, cookware, etc. When the squash is soft & cooked through, turn off the stove—its time to blend the soup! I use an immersion blender for this, but you can use a food processor/blender, too. It's just that the immersion blender makes things so much easier and you should all get one (no, really).